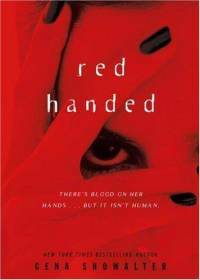 Red Handed is the first of two YA books in the Alien Huntress world. Its heroine is Phoenix, a 17 year-old with a rocky past. She has a drug history but is working to overcome it as she learns that the peace between humans and aliens is more fragile than she ever knew. Phoenix is freshly out of rehab when she is at a party that’s crashed by evil aliens. She fights them off, capturing the attention of the Alien Investigation and Removal agency. Her mom thinks she’s using again and sends her off to what she thinks is a boot camp. It’s actually training for AIR. Phoenix has a lot to overcome, but really begins to feel at home in her new environment. She makes friends and fights her feelings for Ryan, an instructor, as a relationship between them could get her kicked out of the program. I liked it. I hope to see more of Phoenix and Ryan –maybe in the grown-up version of the series.